Since launching my No-Brainer Scenario kit last week, I’ve been reflecting on the project. What worked, what didn’t. What I’d like to do differently next time. I decided to put it here so that you could apply the parts that fit to your own projects. I committed to a launch date sooner than I usually do. And in case you’re wondering, I found the date by listening to my body. In the past I tended to wait as long as possible to set a date because I was afraid I’d get stuck launching before I was ready. But what I’m learning is that committing is a necessary part of the process and critical to the project’s success. Committing activates my energy in a different way. And as long as I’m mindful of my capacity and check in with myself on the date I’m choosing, it works. Everything comes together in the end. I set milestone deadlines to help keep me on track, and I met them. Sometimes when I’m planning a project, it’s hard to see all the moving parts clearly. Maybe it’s not clear how long it will take to do some things. Which means it’s hard to know when I’ll get to certain other things. But by working backwards from the launch date (which was January 24), I could see there were some things that had to be done by a specific date. I needed to have time to test my shopping cart setup, which meant there had to be something to test by the 22nd or 23rd. Which meant I needed to have my final PDF files by the 21st. Which meant I needed to have review copies sent out by the 12th, and back by the 18th or 19th. You get the idea. I plotted out what I knew first, and worked from there to fill in more of the blanks. As long as you’re on track with your milestones, it’s very likely you’re on track for the project as a whole. On days I didn’t feel like working, I still sat down, opened the draft and tried. Keeping to a schedule helped me experience more flow with this project. I felt productive because I was productive. Doing even an hour of work one night would help me gain momentum the next, because often that little bit of progress was all that was needed to get over the hump to that next burst of creativity. Schedule (and commit to) more recovery time and replenishing activities throughout the project. Simultaneously, my body started demanding more attention with a big increase in back and neck pain. Between the extra pushing and not consistently nourishing myself, by the time I launched I was utterly depleted. On top of that, thanks to having a history of ignoring my body’s needs, I don’t exactly have a go-to list of ideas to pull from. What does my body need in those times? I do know that getting away from the computer is a good thing. Beyond that, I’m still learning. I need to plan some replenishment experiments to figure this stuff out. Also, when you don’t do the things you need to replenish yourself, it takes longer to recover. Practice trusting that what I’ve created is what my people need. There were times when my perfectionism got in the way of progress. I kept second-guessing whether certain sections were clear, or if I needed to add more examples. I futzed around with the formatting longer than I should have. And every time I messed with the line spacing, it would change the page breaks, which meant I had to correct the white space. Since this is the longest workbook I’ve created, I have no idea if there was a way to avoid that, or if that’s just part of designing a book. Hence the need to practice trust, since there’s no black-and-white answer to either of those questions. Allow even more time for pre-launch (and post-launch) promotion. I did better at this than in the past, but I find it challenging to switch between creating the actual product and the “extra” stuff needed to generate excitement and get the word out. I made meeting the launch deadline my top priority, so I let a couple of blog posts slide. Mostly I need to find the pre- and post-launch activities that are effective without making me feel like I need to take a shower. At the same time, I can already see that I’ll be able to balance the two needs of “creation” and “promotion” better next time as a result of what I did this time. What do you do well in your projects? What do you struggle with? What are your favorite post-project recovery activities? 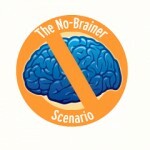 The launch celebration for The No-Brainer Scenario: A Simple Tool for Powerful Clarity is ending Friday, Feb. 4. There are still coaching bundles available. Got a project you want to finish (or start)? Let me use all my project planning superpowers to help you super-charge your progress! This entry was posted in in the hard, No-Brainer Scenario on January 31, 2011 by Victoria. I’ve been working on my No-Brainer Scenario ebook for a little over three months now. The past few days have been about finishing the somewhat tedious tasks that are needed to make a product available. Shopping cart buttons, zip files, creating PDFs, editing and converting sound files, sales page tweaks. Yesterday I got to the point where every last task on my project to-do list was done. I had started a few posts, but it always felt forced so I’d set it aside for later. But once you get to the end of your task list, there is no more later. I managed not to panic, and instead asked my ebook what it wanted me to write. “Okay. What about it?” I replied. And that made me laugh because I wanted it to tell me why I love it, and it wasn’t going to cut me any slack. I love this ebook because it’s beautifully simple and helpful in a loving and compassionate way. It’s simple because the technique is easy to remember, and has only four steps. It’s loving and compassionate because you can start where ever you are. There are no radical changes required. It’s gentle. And meant to be used with curiosity. I’m so thankful for the help I received along the way that allowed this ebook project to flourish. Special thanks to Hiro, Fabeku, Sandra, and Maryann. My wish for this ebook is that it will be a starting point in helping you exercise your power to choose and create the things you want for your life. Without further ado, allow me to present The No-Brainer Scenario: A Simple Tool for Powerful Clarity. Please join me in celebrating! Virtual cake and champagne all around! This entry was posted in No-Brainer Scenario, updates on January 24, 2011 by Victoria. One of the most important aspects of getting clear on what you want is to set aside the how. At least temporarily. What I mean is, you need to think about what you want (in life, work, whatever) first, without worrying about how to make it happen. You probably want some pretty big things. Like a business you look forward to spending time with. One that supports you without draining you. Maybe it’s really big. Like world-changingly big. When you want something that big, it’s easy to focus on the distance between where you are now and where you want to be. Big things often come with (what seems like) a big distance to travel. It can feel overwhelming and hopeless. There’s nothing wrong with you. And it certainly doesn’t mean you chose the wrong thing to want. The reason it feels overwhelming is because the You who will get there is not the You of today. You-Today isn’t quite ready for all that’s involved in arriving at your destination. And that’s perfectly fine, because you’ll be ready by the time you’re there. You’ve walked in the dark with a flashlight, right? Or maybe you’ve even gone scuba diving at night? The flashlight shines a certain distance. Beyond where the beam ends, you can’t see anything. Because it’s dark. When You-Today is thinking about your dream business (or dream whatever-it-may-be) and starts to worry about the How, it’s like you’re trying to look past where your flashlight is shining. Of course that’s going to be scary because you have no idea what’s there in the darkness. And if every time you think about what you want you feel scared because of the How, it’s won’t be long before you stop trying to think about it. Or maybe you’ll choose a smaller dream. Once you do that, you’re not getting clear on what you want anymore. You’re getting clear on what you think you can have. The way to keep the What separate from the How is to create a container. It sounds mysterious, but it just means to give yourself a safe place to think about those big dreams, without looking out past your flashlight beam. The container lets you get clear on what your dreams look like without worrying about how they will happen. A simple place to start? When you’re thinking about what you want, keep reminding yourself that it’s just information. And that you’re not committed to following through on any of it. You can also let your body guide you. It knows what you want, and if you can put the How aside, it will help you stay on the right path. Creating a container is also what the No-Brainer Scenario does. It gives you a way to feel safe while you explore what you truly want. Once you’ve spent time with what you truly want, only then should you start thinking about the How. Have you experienced the “shut-down effect” of worrying about the How too early in the process? How did it affect you? Do you have a favorite way to create a container for exploring those big things you want? The No-Brainer Scenario: A Simple Tool for Powerful Clarity – an ebook to help you know what you want so you can make it happen – will be available January 24. This entry was posted in clarity, No-Brainer Scenario on January 18, 2011 by Victoria.